It’s peach season here in Ohio. Fresh peaches are my absolute favorite fruit. I ordered a ton from a local food hub and have been working on eating them and preserving them. They are so sweet and delicious. Each year, I have to make some peach “candy” for my family. My 4 year old and husband are especially fond of these and they are so simple to make. First I washed the peaches well in some water and white vinegar. I got a large bowl and added about 6 cups of warm water. In the water I added 2 TBS honey and 1TBS cinnamon and gave it a good stir to melt the honey. Then I sliced the peaches into thin (about 1/4 inch thick or thinner) slices and placed them in the bowl with the water/honey cinnamon. I leave them in and swish them a bit, just long enough to get coated in the syrup. Then they go on the dehydrator trays. I let them run for close to 6 hours checking after 4.5 hours to see if they were dried. I left the skin on, you can remove it if you’d like. Whatever makes you happy. I store them in a mason jar and keep them in the fridge. They don’t last long around here. What is your favorite way to preserve peaches? Today was one of those days with never-ending errands. I swear I loaded, unloaded and re-loaded my toddlers into the car at least 10 times today. Dinner time rolled around and we were just getting home (of course). I needed some comfort food and had some leftover chicken I needed to use up, so I made Chicken Spaghetti. This meal is a family favorite and a crowd pleaser. 1 package of spaghetti noodles. In a large pot add 5qts of water and your chicken, bring to a boil. If using cooked chicken, it will be warm enough by the time the water boils. If you are using fresh or frozen, boil until chicken is cooked and remove chicken, shred, and add back to the water. Add your spaghetti noodles and boil until cooked. Strain noodles and chicken and add it back to the pot. Add in the Velveeta and stir until mostly melted. Add in the Rotel tomatoes, and cans of soup. Mix until everything is fully incorporated. That’s it! Quick and Yummy! My favorite is leftovers the next day, all the flavors get all soaked into the noodles and it is so good. Creating a more self-sufficient life is something I strive for. We’ve taken a few very small steps towards self-sufficiency like having a garden and planting some fruit trees and bushes. Hopefully, soon I will get our garden under control and in a few more years, our fruit starts producing. We’ve decided to take the leap and get some chickens. 4 Buff Orpington chicks to be exact. They should arrive in the second week of August. I’ve been collecting items to make a little DIY brooder for them when they arrive. I plan to keep them indoors for about 8 weeks and then they will move to our coop outside. It’s been built for a while and just waiting for our fluffy friends to move in. In the spring I will work on building an outdoor run for them. I’m too chicken (haha) to free range them in our yard. We have several hawks, owls, fox, racoons, etc patrolling the area daily. Baby Steps, but still we are moving in the right direction. So, stay tuned for updates on our little nuggets. We are all very excited to add them to our family. PS. If you have any tips or tricks about raising chickens that you’d like to share, leave them in the comments. I start most days with the best intentions. I create long to-do lists in my mind at night when I can’t sleep. I tell myself I will wake up and get it all done. Then morning comes. I try to get up before my kids so I can get a little quiet and coffee in. As I sit and sip my coffee I tell myself, after this cup, I will get all the stuff done. When I finish my cup of coffee and the little ones are still asleep, I tell myself that I can’t do any of the things on the list, because it’ll wake them up. So I get more coffee. Then, I hear little footsteps. Once the kids are up, my day is a blur. Diapers, drinks, food, naps, diapers, cartoons, diapers, drop teens off at friends, pick them back up. Then finally nap time. My 2-year-old is sneaky sometimes and snuggles me right to sleep with her. Next thing I know, It’s 5 o’clock and hubby is on the way home and I haven’t made a plan for dinner. Days like these, I feel like a failure. I look around and see the house is a mess, the to-do list is still full and everyone is hungry. I run into the kitchen, yank open the fridge hoping there is something quick and easy sitting inside, nope. So I pull open the freezer and stare at all the frozen stuff that would take forever to defrost then cook. So I go to the pantry, Yes! Breakfast for dinner! I grab a pack of bacon and the Bisquick and get to work. To make things quick and less messy, I bake the bacon. A trick I use with a large family and a pack of bacon…I always cut the entire pack of bacon in half. This way everyone thinks they are getting lots, but really it’s only about 2 strips each. Sometimes my older kids jump in and help out too. The kids think I’m being a fun mom, and the hubby comes home to a cooked meal. I pretend this was my plan all along. Everyone is happy. Do you have a go-to meal for when you haven’t planned meals, or, overslept during nap time? Growing up, my favorite was watching my mother and grandma cook. Every time a dish was prepared and placed on the table, I felt loved. Now I try to make my friends and family feel loved when I cook for them too. Sometimes my meals are sub-par, and sometimes they are a hit. I still enjoy the process. I really enjoy trying new recipes and methods of cooking. I love the challenge. Sometimes though, I just want something my Mama used to make. Yesterday was my Hubby’s birthday. 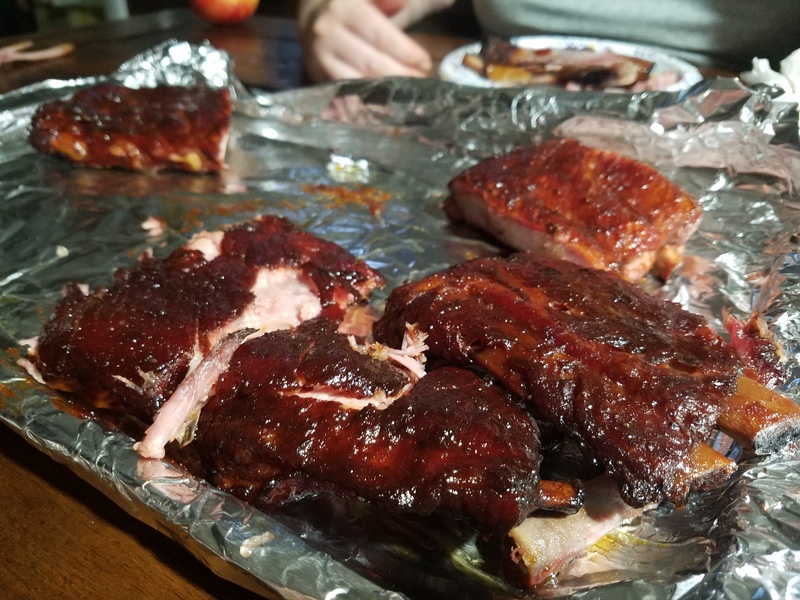 He spent the day smoking ribs in the smoker and so I decided to go with the BBQ theme for side dishes. Like I always do with this recipe, I called my mom and asked for it again. I love using it as an excuse to call. Every time she tells me I should write it down, but I never do. So here it is, my Mama’s Mac Salad. Bring 8 cups of water to boil, add Elbow Macaroni and the 4 eggs (this is how Mama would do it). Once the pasta is cooked, strain, remove eggs and set both aside to cool. While you’re boiling and cooling the pasta and eggs, begin chopping your other ingredients. Add everything to a large bowl. When the eggs are cooled, peel them and then grate them into the bowl with the other ingredients. This allows the egg to be really nicely dispersed through the salad. If you prefer you can chop,slice, smash etc. It’s really up to you, but Mama would grate it. Add in relish and then the cooled pasta. I usually give it a good stir at this point. Then I add in the Mayo and some salt and pepper. Give everything a good stir so it’s well incorporated. This should really be refrigerated a few hours to allow all the flavors to really come together. 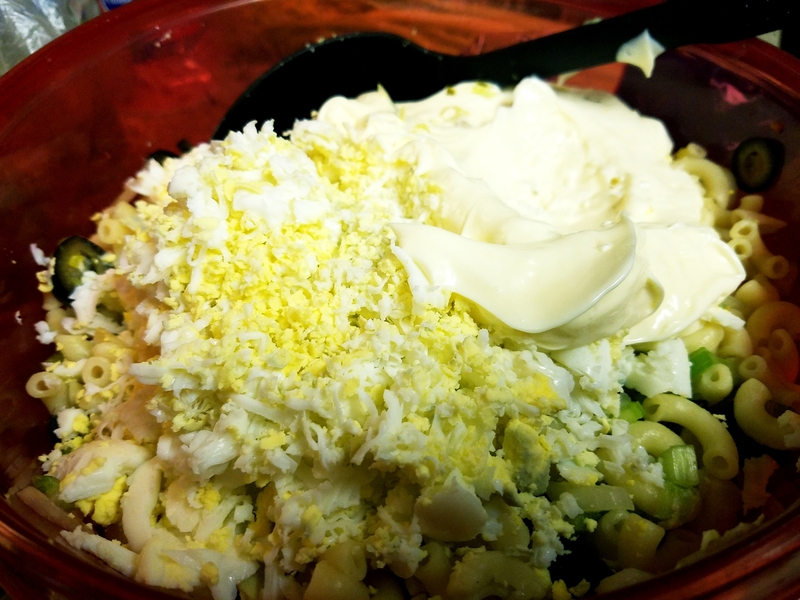 Sometimes after refrigeration, the noodles have soaked up a lot of the mayonnaise and moisture. It’s okay to add a little more mayo and mix at this point. 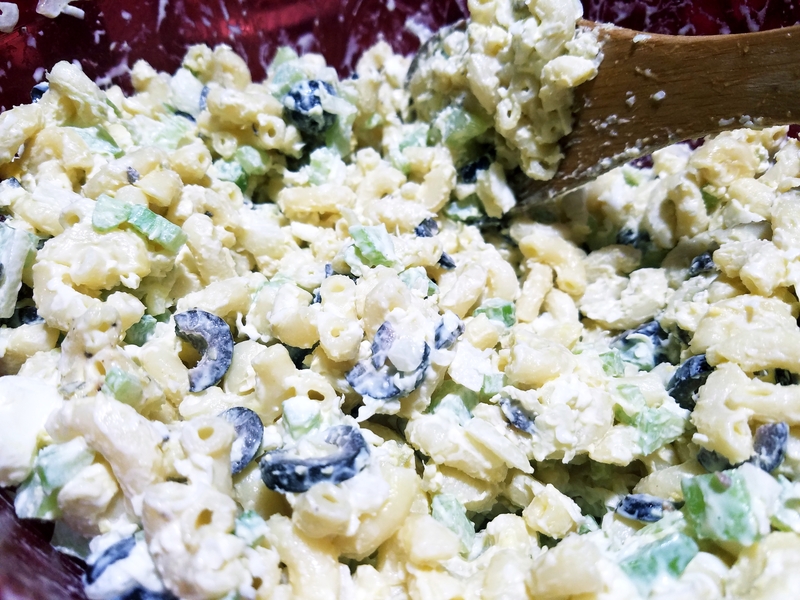 Nobody likes a dry macaroni salad. And there you have it. Quick, easy and delicious.